The Proform 540 treadmill is another great looking Proform machine that comes with cheap parts. But compared to the brand's other models, this unit has a longer motor warranty. This treadmill is perfect for people who are in the market for budget treadmills. 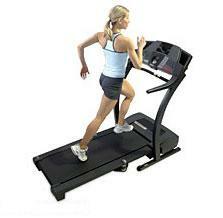 Proform is known for making affordable budget treadmills like this one. However, budget treadmills are not for runners. They lack the power, quality and features most serious runners are looking for in a fitness machine. However, if you really want a quality treadmill at an affordable price, I suggest you visit our best treadmill buys page. There, you will find our best recommended treadmills based on price. As an alternative you might want to check out our best treadmill page. The 2.75 THP/1.75 CHP motor is capable of sustaining speeds of up to 10mph. Also, it can be elevated up to 10% for maximum intensity. But due to its low quality, maximizing this machine’s capabilities is definitely not recommended. The One-touch QuickSpeed control allows you to change the speed of your run from 0-10mph without the need of holding down buttons. While the power incline feature makes it easy for you to slant the machine for a more intense workout. The 19” x 55” tread belt comes with ProShox™ impact absorption system. It reduces stress on your joints and back so you can have the most comfortable and injury-free run in every workout. This treadmill’s 7 built-in workouts along with the optional iFIT technology keep your workouts interesting and fun. Moreover, the EKG heart rate monitor enables you to workout in your target heart rate zone. The SpaceSaver® fold away design allows you to fold-up the treadmill after use so it doesn’t take up any extra room. This feature is perfect for those with limited spaces at home. And finally, the built-in two-speed CoolAir™ workout fan creates currents of 4-6 mph, the ideal range for body cooling. It keeps you fresh especially during those long, grueling workouts. Other than its cheap price tag and pretty design, I don’t see any other reason why you should buy a Proform 540 treadmill. It doesn’t offer much in terms of value, features, quality, and reliability. If you still plan on buying a Proform 540 treadmill even after reading this review, I suggest you buy from Proform. They offer the cheapest price around the net. You can get it for just $599.